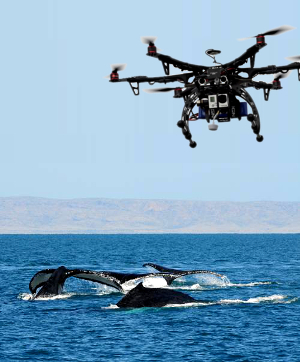 Australian marine experts are working on new ways to monitor whales non-invasively, sending airborne drones to have a look. The Murdoch University study is using an Unmanned Aerial Vehicle (UAV) to capture unique aerial imagery of humpback whales for the first time. The images will be used to measure seasonal changes in body condition of wild humpback whales in the Exmouth Gulf, and its influence on calf growth and condition. "Little is known about the link between body condition and reproduction in large whales, which makes it difficult to monitor the health of baleen whale populations," says lead researcher Dr Fredrik Christiansen. Baleen whales are some of the largest mammals on Earth, including the blue, minke, right and humpback whale species. Dr Christiansen says current practices for measuring these whales were not suitable for vulnerable populations. "Methods to assess body condition in free-living whales are scarce so there is a need to develop and test new methods to measure body condition in large whales," he said. "This study looks at the feasibility of using UAVs to take aerial shots of whales, from which body condition can be assessed." The study targeted females with calves that enter Exmouth Gulf from August through to October. It showed that the sheltered bay serves as an important resting and nursing ground for the whales during their southern migration back from their breeding grounds in the Kimberley. "We want to see how the body condition of the females relates to that of the calves. So if the females are in poor body condition, are they having calves that are also of poor body condition? That is what we are particularly interested in finding out," Dr Christiansen said. The ability to monitor the body condition of the humpback whale population is extremely valuable, as it allows researchers to make global comparisons between baleen whale populations. "In the future we can compare the west coast of Australia to the east coast and also to other populations globally. You can also look at the body condition of whales over time in relation to productivity in Antarctica, their feeding ground," Dr Christiansen said. The latest findings will be available soon.